Having access to information about the quality of care delivered by physicians and hospitals is crucial. After all, what you don’t know could kill you. Last week we blogged about price transparency, but the availability of information regarding the quality and safety of care is just as important, if not more vital than the price of care. Fortunately, two resources were recently published online about the quality of care provided by hospitals and surgeons in Connecticut. These can help individual consumers make decisions about where to get care and can motivate hospitals to provide safer care. The first resource is this video posted on our Facebook site. The video accompanied the article, Do no harm, written by Sarah Kliff of Vox. Both focus on the dangers of central line infections. A central line is an intravenous line that is inserted into a vein under your collarbone to get medications and nutrition directly into the bloodstream, right near the heart. It also requires data, and a dedicated, step by step effort. Where do Connecticut’s hospitals stand when it comes to central line infections? Vox provides an online resource to answer that question. By entering Connecticut in the search field, you can explore the central line infection rates of most of the acute care hospitals in the state. This information is empowering for patients who want to know their hospital is doing everything it can to keep them safe. But it’s also potentially empowering for the hospitals themselves to make change. 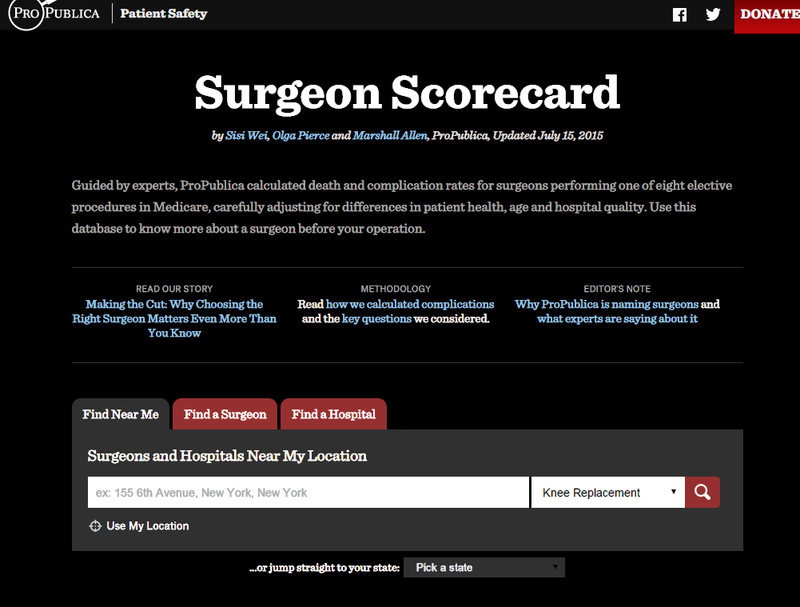 A second online resource is the Surgeon Scorecard, published last week by ProPublica. If you select Connecticut where it says “or jump straight to your state,” you can compare the complication rates of surgeons practicing at each hospital in the state for eight different procedures. The data shows how many surgeons have complication rates that are low, medium or high at each hospital. For example, of the 28 hospitals that perform knee replacement surgery in Connecticut, 12 (43%) of them have at least one surgeon with a high complication rate and 5 (18%) have at least one surgeon with a low complication rate. When it comes to hip replacements, 9 (32%) have at least one surgeon with a high complication rate and 4 (14%) have at least one surgeon with a low complication rate. We Have a Better Way, But it’s Secret, by Paul Levy from his Not Running a Hospital blog, talks about other data on surgeon complication rates that right now is not available to the public. The comments are worth a read, too. The ProPublica Scorecard: A Step in the Right Direction by Harvard-affiliated physician and health policy researcher Ashish Jha, acknowledges that the information published by ProPublica is not perfect, but also applauds the data release as a “disruptive innovation” that will ultimately lead to making the system better. This entry was posted in Jill Zorn and tagged Cost & Quality, Hospitals. Bookmark the permalink.